‘The Lost Boys of Sudan’ was a title given to the approximately 20,000 Sudanese children who were displaced during the second Sudanese Civil War. The Good Lie tells the story of four such children, Mamere and his sister Abital, and brothers Jeremiah and Paul. When their village is attacked and their parents slaughtered, the children are forced to flee by foot. They walk first to the Ethiopian border, and when no help is to be found there, to the Kenyan border. After 785 miles of walking they arrive at Kakuma Refugee Camp, where they will stay for 13 years before receiving the news that they are to be relocated to America. On arrival though, they discover that the three men are to be settled in Kansas City while Abital is to be sent to Boston. According to program rules, while men can be settled together, females must be placed with families. As the three men struggle to fit in and endeavour, with the help of an employment agency counsellor, to make a life for themselves in Missouri, they also work to reunite their family. The demands of movie marketing means that Reese Witherspoon has to top billed and feature strongly in advertising campaigns. In all likelihood the film only got financing as a result of her agreeing to star in it. But this isn’t her film. 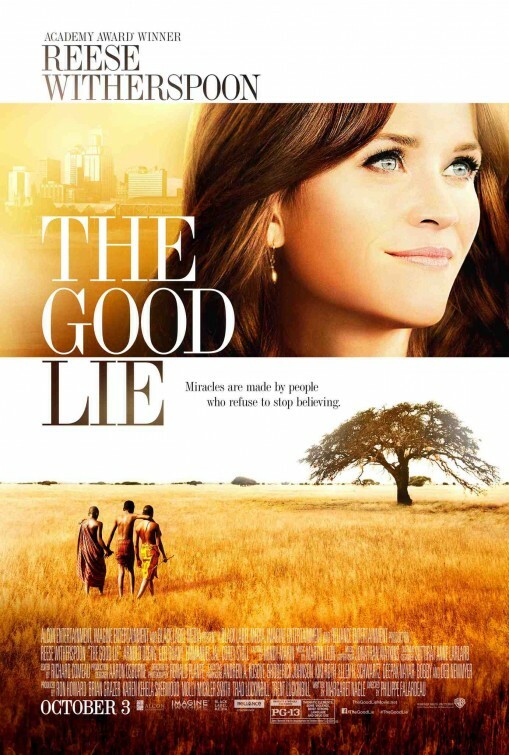 While the trailers for The Good Lie would suggest that it is going to be The Blind Side without the football, the great strength of the film is that it is actually allowed to be their story rather than hers. Rather than another white-person-rescuing-black-people narrative, the young Sudanese characters are actually allowed to be the heroes of their own story. The central quartet of African characters are all played by actors who are either Sudanese refugees themselves, or the children of refugees. Two of the performers were even former child soldiers. While their acting can be a bit stilted at times, especially in moments of high emotion, knowing their real-life backgrounds adds to the sincerity of the story. But as much as The Good Lie is refreshingly different in its willingness to put the African characters front and centre in its narrative, there are moments in the film that are frustratingly familiar. Screenwriter Margaret Nagle drew upon real stories and experiences in creating her fictional character, which makes it disappointing when things feel a bit inauthentic and it feels like we have seen certain scenes before. There is some gentle culture clash humour that is drawn from watching these characters acclimatising to life in America. While some of this humour is subtle – a sweet moment when Jeremiah offers half of his orange to a woman sitting next to him on the bus – at other times it can feel like cheap laughs – they don’t know how to use a telephone! Ha, ha! Despite this, the movie’s heart is clearly in the right place. The Good Lie is obviously a real passion project for its writer and director. Nagle fought for the best part of a decade to bring this important story to the screen, while French-Canadian director Philippe Falardeau was drawn to the project (his first English-language feature) after he was forced, years earlier, to abandon a documentary he was shooting in the Sudan about the plight of these refugees. While the execution is imperfect, the story is still incredibly affecting and empathetic, leading you to forgive other elements of the film. Ultimately The Good Lie is more than just a movie, with the producers launching ‘The Good Lie Fund’ (www.goodliefund.org), hoping to use the profile of the film to raise funds for educational and humanitarian programs for Lost Boys and Girls communities. Have you seen The Good Lie? Leave a comment and let us know what you thought. In 1993, the town of West Memphis, Arkansas was rocked by the brutal murder of three young boys. After a short investigation, three teenage boys, who would come to be known as the West Memphis Three, were arrested for the crimes. Despite stunning investigative blunders, a complete lack of physical evidence linking them to the murders and a confession filled with errors, they were found guilty of the murders. On 19th August 2011, after the presentation of new evidence, the West Memphis Three were released from prison having served 18 years. 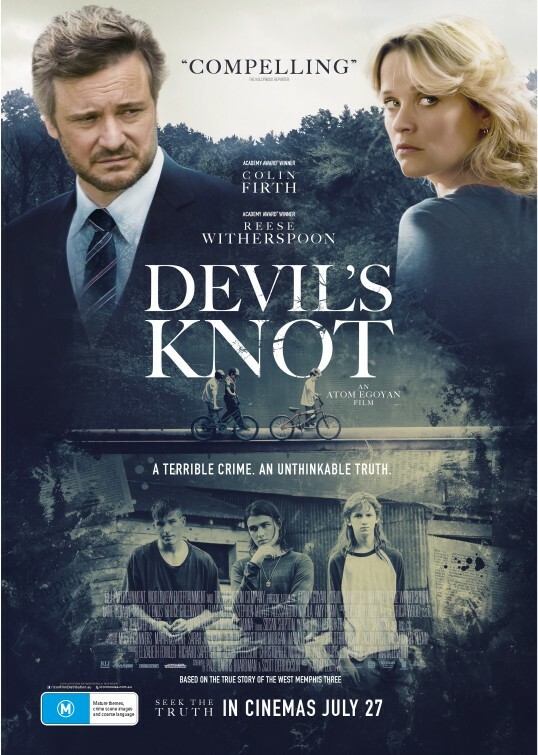 Devil’s Knot, based on investigative journalist Mara Leveritt’s bestselling book, explores the farcical events which saw the three teens convicted. The film has two main protagonists. Pam Hobbs is the mother of one of the murdered children. Ron Lax is a private investigator. Between them we are given two perspectives on the events. Pam gives us the view of the shaken townspeople, Ron a seemingly more impartial view of the facts. Rather than seeking to answer the question of who actually committed the crimes, Devil’s Knot is more interested in examining how a community deals with fear. We watch as a town gripped with hysteria turns on those who are different. The three teenagers are vilified for their black clothes, heavy metal music and interest in the occult, none of which is acceptable behaviour in this conservative Bible-belt town. We see how an investigation literally became a witch hunt, and the legal systems of the town were deployed to simulate retribution. We watch people whose desire for answers and to apportion blame trumps their sense of logic and reason. The case of the West Memphis Three has already been the subject of numerous books and documentaries, some of them quite good. Where Devil’s Knot struggles to add to this pool of material is that it does not have a clear purpose. Pre-production on the film started before the release of the trio. As such, its initial purpose was to expose the trial for the farce that it was and to campaign for the release of the three no-longer-young men. However, when the state of Arkansas released the West Memphis Three, the project’s original purpose was no longer required. While the case is still interesting, and the film presents it methodically, it simply fails to grip you. A devil’s knot is a knot which theoretically cannot be opened. It is a puzzle without a solution, and that is exactly what we are given with this film. We leave the film with an incomplete picture. Devil’s Knot answers the question of who did it only by concluding that the trio in question did not. The film hopes to trouble us with its lack of resolution, but with this material having been explored before, albeit not in a feature film, its lack of new insight and unwillingness to speculate only serves to frustrate and underwhelm. Have you seen Devil’s Knot? Leave a comment and let us know what you thought.